Katie surprised me with an Anova Sous Vide for my birthday. If you had a chance to read my previous posts on the sous vide technique, you'll remember that it is an incredibly precise and fool-proof way to cook meats. Last time, I used a ziplock bag and a beer cooler. This time, having the correct appliance, it was much easier. With Katie's parents in town to visit, we broke it in earlier this weekend on some beef for Steak Frites - but the real test is always with a leaner piece of meat like pork tenderloin, which is historically easy to overcook. The Anova delivered as promised, getting the pork to a perfect medium-rare 145 Fahrenheit before a hard sear to finish. You can easily prepare the pork using the 7-6-5 method outlined here if you don't want to use either of the sous vide methods we've used at Rotio/Food. Served over bacon Brussels' Sprouts with a garlic gorgonzola cream, it was a nice decadent way to round out Valentine's Day weekend. 1. Preheat oven to 450 degrees Fahrenheit. Cut Brussels' Sprouts in half. 2. Combine Georgia Clay (Brown sugar, spice, smoked salt, granulated garlic, granulated onion, black pepper, cayenne pepper) and orange juice. Rub onto pork tenderloin. 3. Cook pork to 145 degrees Fahrenheit using either method above. 4. Cook bacon on medium heat until crispy. Remove bacon. 5. Fry brussels' sprouts in bacon fat until golden brown and place in oven until tender, about 10-15 minutes. 6. Heat garlic on low in saucepan until soft and tender. Add cream and bring to simmer. Add gorgonzola until melted. 7. 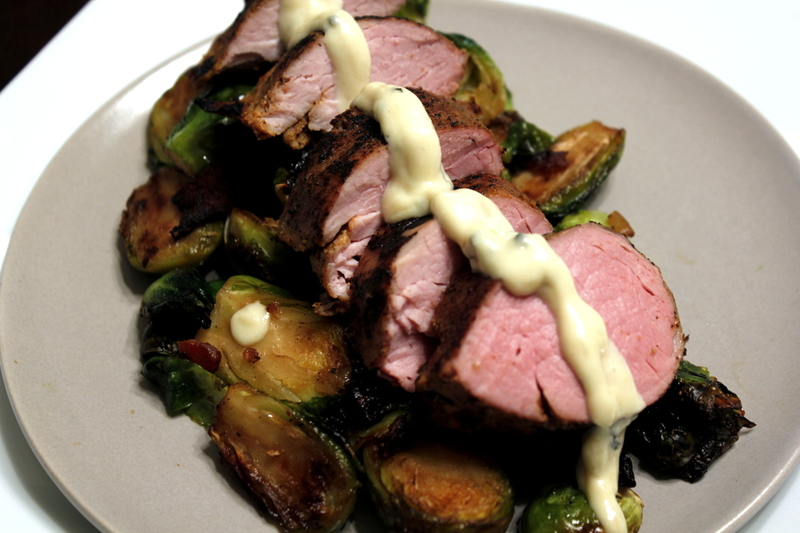 Plate Brussels' Sprouts, Sliced Tenderloin, and Gorgonzola Cream. Salt and Pepper to taste.